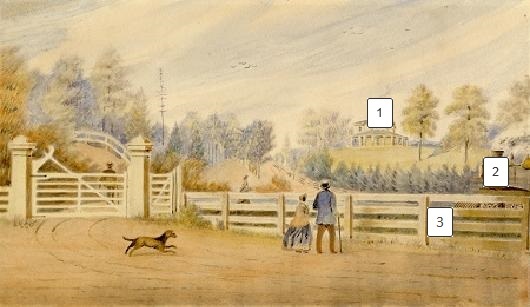 The Entrance Gate to Colborne Lodge, 1855-65. Toronto Public Library Collection, TRL, JRR 833. 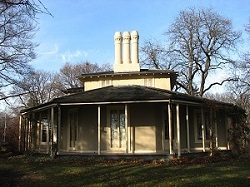 Colborne Lodge sits on top of the highest point of the Humber Bay shoreline, overlooking Lake Ontario, which inspired Jemima Howard to refer to their property as High Park. The parlour’s three French windows connect it to the verandah, providing comfortable views of the lake in both summer and winter. At the height of the railway era, three railway companies would operate in Toronto: The Ontario Simcoe and Huron Railway (also known as the Northern Railway), the GWR, and The Grand Trunk Railway. The GWR and the GTR merged in 1882 , and formed the basis of the Ontario portions of the Canadian National Railway . For more information about Toronto’s rail history, visit the Toronto Railway Historical Association. 5 http://www.railways.incanada.net Accessed November 18, 2013. Today the view from Colborne Lodge is disturbed by the train tracks and major expressways from the lake. The train in this painting was from the Great Western Railway company. In 1854 John Howard conveyed a strip of his land to the GWR for the price of £300. One year later, train service between Hamilton and Toronto3. 3 http://www.railways.incanada.net Accessed November 18, 2013.